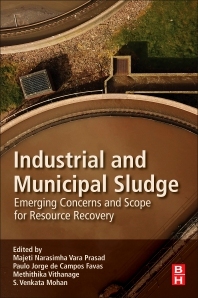 Industrial and Municipal Sludge: Emerging Concerns and Scope for Resource Recovery begins with a characterization of the types of sludge and their sources and management strategies. This section is followed by specific chapters that cover Emerging contaminants in sludge (Endocrine disruptors, Pesticides and Pharmaceutical residues, including illicit drugs/controlled substances), Bioleaching of sludge [with an enriched sulfur-oxidizing bacterial community, Recovery of valuable metals (Bioleaching and use of sulfur-oxidizing bacterial community, and Biogas production by continuous thermal hydrolysis and thermophilic anaerobic digestion of waste activated sludge. In addition, the book includes numerous tables and flow diagrams to help users further comprehend the subject matter. He received an MSc in Botany from Andhra University, Waltair, 1973–75 and a PhD (Botany) from Lucknow University, Lucknow, 1975–79 (research conducted at Birbal Sahni Institute of Palaeosciences, an autonomous institute of the Department of Science and Technology, Government of India). He worked as a lecturer, June 1980–85in the Department of Botany, North Eastern Hill University, Shillong. Later he moved to the University of Hyderabad as a senior-scale lecturer, July 1986–90, and as a reader, February 1990–98, and Professor in the Department of Plant Sciences, School of Life Sciences 1998-2018. He has made significant contributions to the field of plant–metal interactions and bioremediation. He has contributed 205research articles in peer reviewed journals, 18 books (as author, coauthor, editor, and coeditor) by international publishers, and has earned ∼ 13,200 Google Scholar citations with an h-index of 58. Professor Prasad was the recipient of the Pitamber Pant National Environment Fellowship for the year 2007 awarded by the Ministry of Environment, Forests and Climate Change, Government of India, the Professor K.S. Bilgrami memorial award for the year 2015 by the Society for Plant Research, India, and the NSERC foreign researcher award. He is also a visiting professor at vari-ous universities, namely, University of Québec Canada, 1994; NSERC foreign researcher awardee, Jagiellonian University, Krakow, Poland, 1996; Department of Plant Physiology and Biochemistry, University of Coimbra, Portugal; Stockholm University, Institute of Botany, Sweden, 2000; University of Oulu, Oulu, by the Finnish Academy, Finland, 2002; University of South Australia, Adelaide, Australia, 2005; Al-Farabi Kazakh National University Botany Department, Almaty, Kazakhstan, 2006; Ural Federal University, Ekaterinburg, Russia; Ghent University Faculty of Bioscience Engineering, Gent, Belgium, 2011; Mahasarakham University, Thailand, 2013–14; and University of Santa Cruz, Ilhéus-Bahia Brazil, 2015. The government of India deputed Professor Prasad to the Asian Institute of Technology, Thailand, for the 2017 January–May semester as visiting professor. Dr De Campos Favas is a professor in the Department of Geology of the University of Trás-os-Montes e Alto Douro as well as a member of the Marine and Environmental Sciences Centre (MARE) from the University of Coimbra. He has been involved in 10 research projects. He is author and co-author of 29 peer-reviewed papers in scientific journals and 136 papers in conference proceedings, has 19 book chapters and 2 books published. His main areas of research are: heavy metals and arsenic contamination (soil, sediment, water); acid mine drainage; bioaccumulation of metals in plants (aquatic and terrestrial environments); hyperaccumulator plants; phytoremediation; bioindication; restoration of degraded mine areas. She is the leader of the Ecosphere Resilience Research Center, Faculty of Applied Science at the University of Sri Jayewardenepura, Sri Lanka, Visiting Associate Research Professor, National Institute of Fundamental Studies, Sri Lanka and an Adjunct Associate Research Professor at the University of Southern Queensland, Australia. Dr. Vithanage’s research approach builds on enabling measurements of concentrations and reaction rates in environmental samples for key/emerging pollutants in the environment in order to assess their fate and transport to discover solutions to remediate those using different geo/bio/nano materials. Dr. Vithanage is particularly interested in elucidating the mechanistic understanding of release/remediation of pollutants with contrasting physical and chemical properties that can be used to obtain insights into environmental partitioning, chemical persistence and ultimate accumulation in biota. To this end, her current research interests are focused on monitoring atmospheric deposition, landfill leachate, water and soil for pollutants, develop and enhance the properties of biochar, nano/geo substances and composites as material for environmental remediation. She has received several awards from,TWAS-NSF Award for the Young Scientist, American Geophysical Union, Presidential Awards for Publications, Awards for science popularization and for post graduate supervision by the National Science Foundation, Sri Lanka. She is a Young Affiliate of the Third World Academy of Sciences. She was the Chairperson of the Young Scientists Forum on the National Science and Technology Commission of Sri Lanka in 2017. Currently, she is the President of the Engineering, Architecture, Surveying Section of the Sri Lanka Association for the Advancement of Science. She has contributed more than 80 Science Citation Indexed journal articles and 25 book chapters. Her citation record is now passed 2300 with an H index of 24. Dr.S.Venkata Mohan is working as Principal Scientist in CSIR-Indian Institute of Chemical Technology, Hyderabad since 1998. He was a Visiting Professor at Kyoto University (2005) and Alexander von Humboldt (AvH) Fellow at Technical University of Munich, Germany (2001-02). His main research interests are in the domain of Environmental Bioengineering Specifically in the areas of Advance Waste Remediation, Aciodogenesis, Microbial Electrogenesis, Photosynthesis and Waste Biorefinery. He has authored more than 310 research articles, 36 chapters for books, edited 4 books and has 9 patents. His publication has more than 12,750 citations with an h-index of 62 (Google Scholar). He has guided 22 PhDs., 2 M.Phils and more than 100 M.Tech./B.Tech./M.Sc. students. Recently, Dr Mohan recently successfully demonstrated a pilot plant for biohydrogen production from waste for MNRE and waste fed biorefinery platform for CSIR. He carried out various industrial and consultancy projects in the area of environmental management. Dr Mohan is recipient of coveted ‘Shanti Swarup Bhatnagar (SSB) Prize’ for the year 2014 in Engineering Sciences from Government of India. He also received several awards and honours, which includes, Most outstanding Researcher in the field of Environmental Science in India- 2018 by Carrer360, as ‘National Bioscience award-2012’ by DBT, Government of India, SERB-IGCW-2017 for ‘Biohydrogen Technology’ from DST-SERB, Environmental Engineering Design Award 2017 by the National Design and Research Forum (NDRF) of Institute of Engineers, India (2017), ‘Prosper.net-Scopus Young Researcher Award in Sustainable Development -2010’ under Energy Category by United Nations University and Elsevier, ‘NASI-Scopus Young Scientist Award- 2010’ in Earth, Oceanographic & Environmental Sciences by NASI and Elsevier, Nawab Zain Yar Jung Bahadur Memorial Prize-1994 by The Institution of Engineers (India), etc. Dr Mohan is an elected Fellow of National Academy of Engineering, Biotech Research Society of India, Telangana and Andhra Pradesh Akademy of Sciences, International Forum on Industrial Bioprocesses, Institution of Engineers, International Society for Energy, Environment and Sustainability, etc. Dr Mohan is National Editor for Science Portal (EVS), subject Editor for the Journal of Energy, Associate Editor for Frontiers in Environmental Science and Frontiers in Energy Research and is serving on the Editorial Board of several journals viz., Bioresource Technology, Advances in Energy Research, Carbon Resources Conversion, etc.